with the presentation of the documentary film, “Within Reach”. Filmmakers Mandy Creighton and Ryan Mlynarczyk will join us for the first showing of their movie prior to a West Coast Tour. Mandy and Ryan created the film while taking a 6500 mile “bike-pack” adventure in a quest to visit 100 sustainable communities across the US. Exhibitors demonstrating a relationship to sustainable living are eligible for an exhibit space. Sustainable businesses involve... (mouse here) Exhibitors demonstrating a relationship to sustainable living are eligible for an exhibit space. Sustainable businesses involve renewable energy, recycling, natural health, green building techniques, alternative vehicles, organic agriculture, landscape conservation and restoration practices, open space conservation, water efficiency technologies, agri−tourism, or eco products. If you’d like to exhibit your service at Verde Fest, please fill out both pages of this application and return it with the exhibit fee to Verde Fest, 38090 ROAD L.4, Mancos, CO 81328. Fees are $50 for a for-profit business and $35 for a non−profit ($5 discount before June 1). Checks should be made out to Mesa Verde Country Festivals with Verde Fest in the memo line. You will be contacted by email to confirm your exhibit space. Registrations received after July 15 are subject to space availability and information about that business may not be included in the Verde Fest Program. Click here for an exhibitor application form in pdf format. Click here to volunteer or cohtact Betty Janes by email or call 533−1051. Fundraising − solicit local businesses for sponsorship. Contact potential exhibitors and provide our literature. Find children’s activity exhibitors or work with children directly. Publicize by contacting newspapers, radio, social media, distribute posters. Design, buy and place signs on grounds. Provide ideas for themes, competition(s), fun stuff! A sustainable, regenerative community is one that preserves and restores the integrity of its natural environment, nurtures healthy human and other living systems, and maintains a vital self−reliant economy, generation after generation. A sustainable, regenerative community meets the basic needs of all people, including the needs for food, water, shelter, health, safety, autonomy, connectedness, and meaning. Yes! 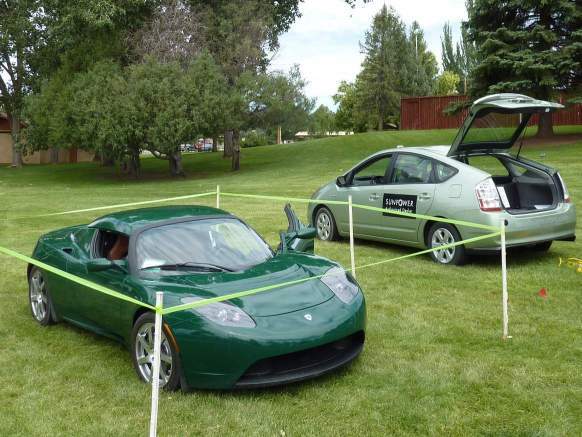 We had a Tesla at the 2010 Verde Fest in the afternoon thanks very much to Mr. Christoph Henkel of Dunton Hot Springs Resort. The plug-in Prius was provided by Love Bug Motors (lovebugmotors.net)of Durango.